Following a refreshing schedule-bye and two weeks of preparation, the Boone Central/Newman Grove Cardinals dominated visiting Columbus Scotus Friday night in Albion, rolling to a 48-14 victory and moving up one position to #3 in the Omaha World-Herald’s Class C1 Top 10. The Cardinals were nearly flawless in Friday’s first half, scoring on each of their possessions, stymieing the Shamrock offense and building a 42-0 halftime lead. While Boone Central/Newman Grove received contributions from numerous playmakers, scoring from long range and short, Scotus popped open occasional plays for first downs, but was never able to mount a sustained attack against the Cards’ top defenders. BC/NG Coach Arnie Johnson, once again, was pleased by his team’s efforts in all phases of the game. “One of our goals after the game against Norfolk Catholic was to get the ball into more of our playmakers’ hands,” Johnson noted. “We did some things with different sets that allowed us to do that against Scotus. Our offensive line did a great job of creating space for our ballcarriers. “Scotus has a pretty good offense and they gave us enough stress that we were able to get better as the game unfolded. Boone Central/Newman Grove was sharp from the outset, controlling the first period with a potent rushing attack and mixing in timely Tanner Mazour aerials. 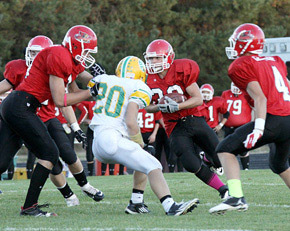 Card halfback Blake Slizoski did the majority of work on the game’s opening possession and capped the scoring drive with a four-yard touchdown run. The senior speedster added a seven-yard TD jaunt with 46 seconds remaining in the first period and BC/NG took a 14-0 lead with Fabian Hohnert’s PAT kicks. While Slizoski (114 yards and four TDs) and the Cardinal offensive line provided the offensive motor, Tanner Mazour again displayed his magic at the controls. Scotus had no answer for the quick, crafty senior, as he completed 12-of-14 passes for 209 yards and two touchdowns and rushed seven times for an additional 129 yards and another score. Mazour’s 46-yard touchdown gallop started Boone Central/Newman Grove’s 28-point second-quarter blitz that essentially buried the Shamrocks.